Dr. Tareshawty specializes in hematology and medical oncology. He is certified in internal medicine with a certificate of added qualification in geriatric medicine by the American Board of Internal Medicine. He is also certified by the American Board of Hospice and Palliative Care. As a graduate of Youngstown State University with a Bachelor of Arts degree in chemistry, Dr. Tareshawty received his medical degree from Universidad Central Del Este, Dominican Republic. He completed his residency at Youngstown Hospital Association, serving as chief resident in his last year. 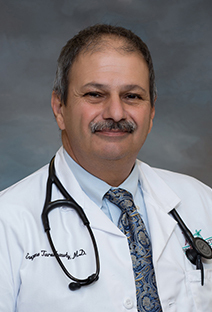 Dr. Tareshawty has been practicing medicine in the Mahoning Valley since 1990 and is active in the local community. He has served on the medical executive committee and as secretary/treasurer of the clinical staff for the Western Reserve Care System, on the President’s Club of United Way, and as an Elder in his church. He is a member of the American Medical Assn., American Academy of Hospice and Palliative Medicine, American Geriatric Society, and serves as the Medical Director for Forum Health at Home Hospice. Dr. Tareshawty is married and has two children. He speaks conversational Spanish. He is a baseball coach and avid chef.